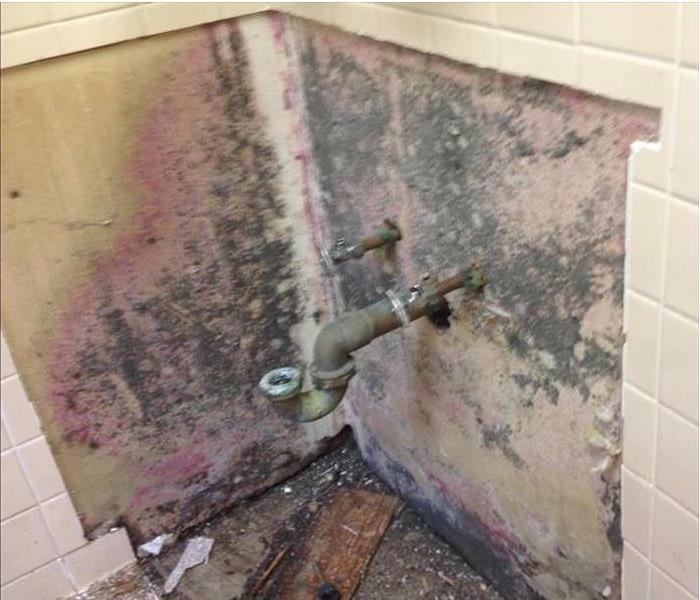 There is no need to destroy an entire wall when the mold has only damaged a small portion as shown in this Durham bathroom. 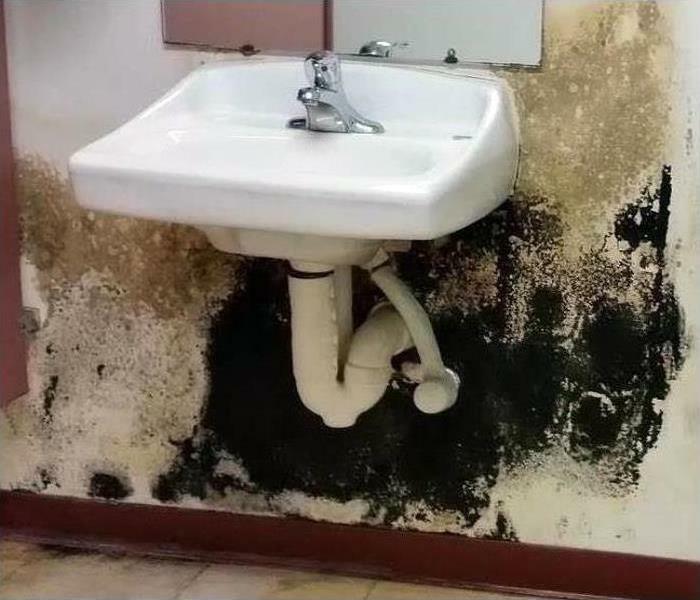 That is Why SERVPRO is the mold remediation company of choice, no extra mess, no extra cost to our customers. 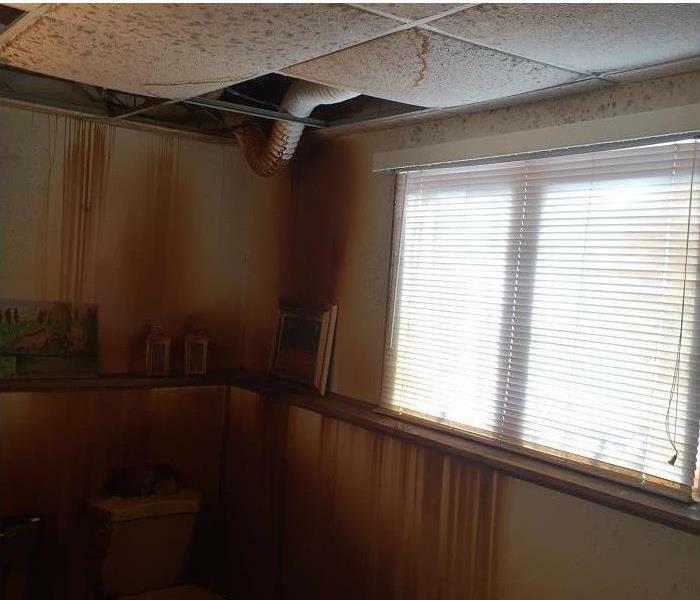 The house fire circulated heated air currents that carried along soot and smoke to this bathroom in Kingston. SERVPRO can wipe down the non-porous porcelain surfaces and clean the grout lines with special sponges and cleaners. Then we can turn to odor control. 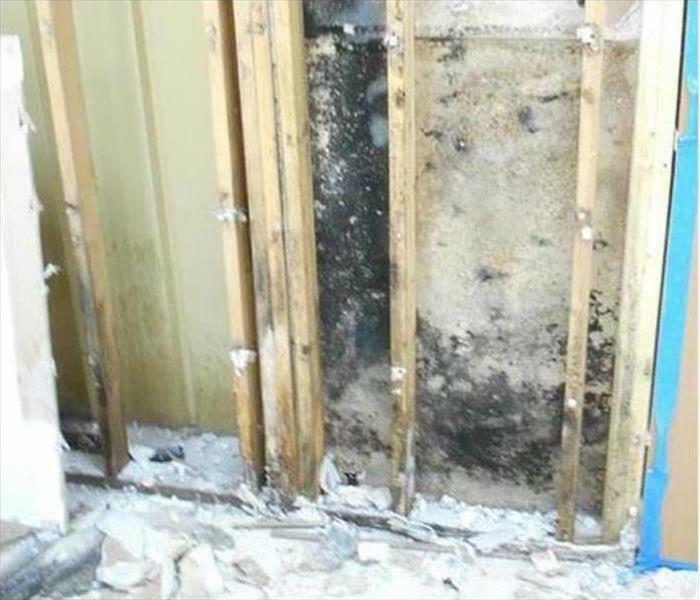 When ignored, moisture inside a wall cavity can lead to a massive and offensive mold infestation. 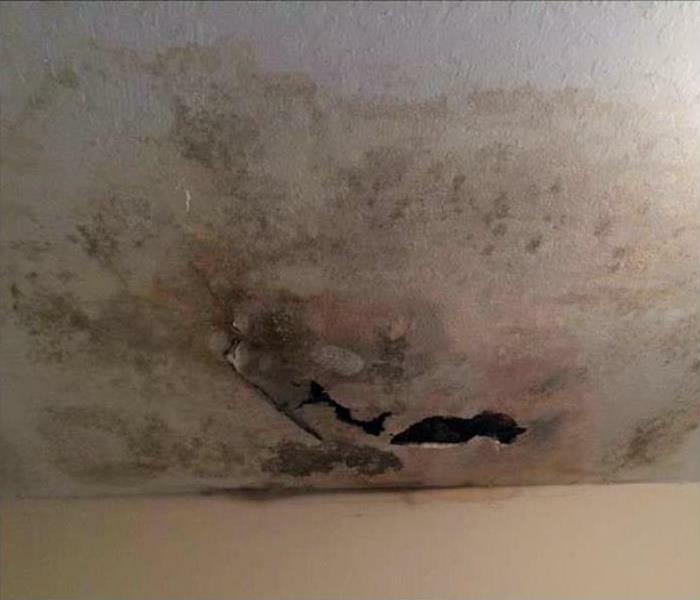 SERVPRO has the solution with a controlled tear out of the non-salvageable materials, the fixing of the leak, and the application of a biocide to inhibit future mold colonies from forming. Why go elsewhere? When a nor'easter storm hits the Durham area, significant damage demands a rapid removal of water and debris. SERVPRO is Faster To Any Size Disaster, the wise choice to mitigate the storm damage and salvage whatever is possible. We can save the hardwood floors. 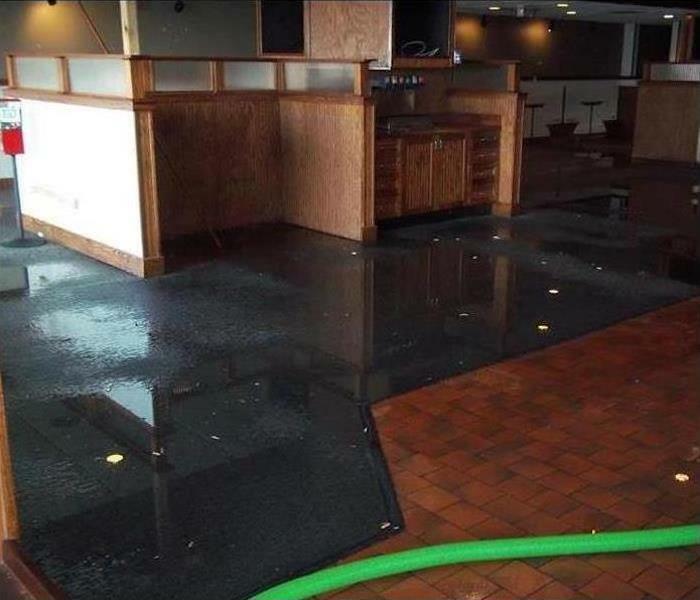 Storm damage occurred at this Durham restaurant due to a band of heavy thunderstorms passing through the area overnight. High winds tore a portion of the roofing from the building allowing rainwater to enter the interior of the building freely. A ripped roof from a storm can allow plenty of water into the crawlspace of a commercial building in Durham. 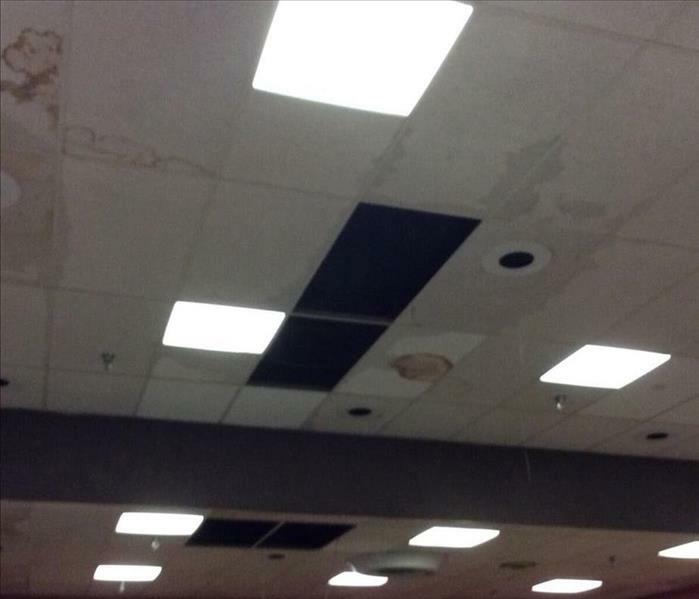 The acoustical ceiling tiles are soaked with water and SERVPRO team members can remove them. This also allows access to the above space to dry out the moisture from the stormwater and prevent mold growth. We do it right. 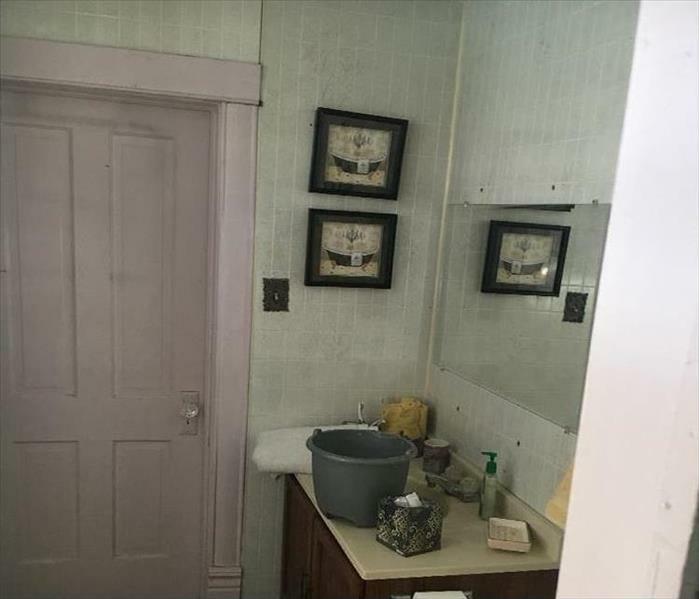 The mold patches blend into the wallpaper, but this Kingston bathroom still needs professional remediation. SERVPRO can provide the service necessary to remove the damage and spray an antifungal agent to exterminate any remaining mold particles or spores. Call us to have it done right, the first time. Fire damage started on the stovetop of this Durham home. This was a grease fire, and grease fires burn very hotly causing considerable soot and smoke damage even when they are extinguished quickly. 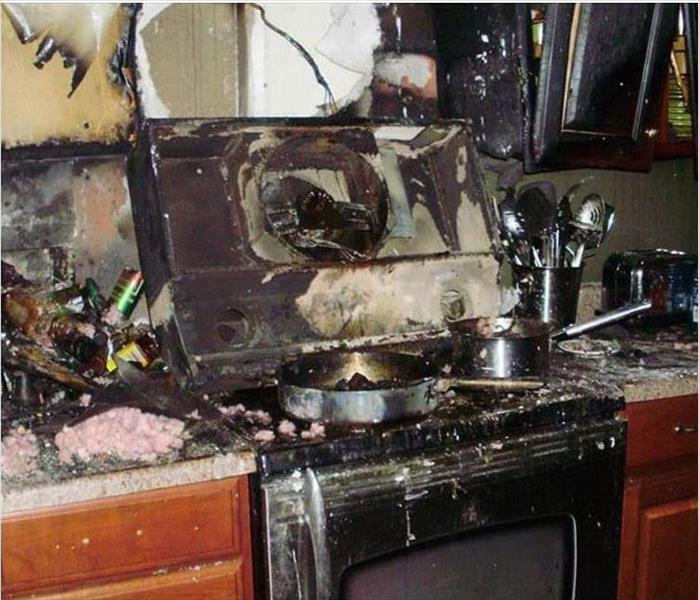 The cabinetry and ceiling of the kitchen involved are usually covered with soot and smoke damage. SERVPRO of Durham’s highly trained and industry certified technicians are capable of cleaning and restoring fire damage of this nature. A mold infestation can grow out of control quickly, and our team is ready 24/7 to respond to your mold damage emergency. 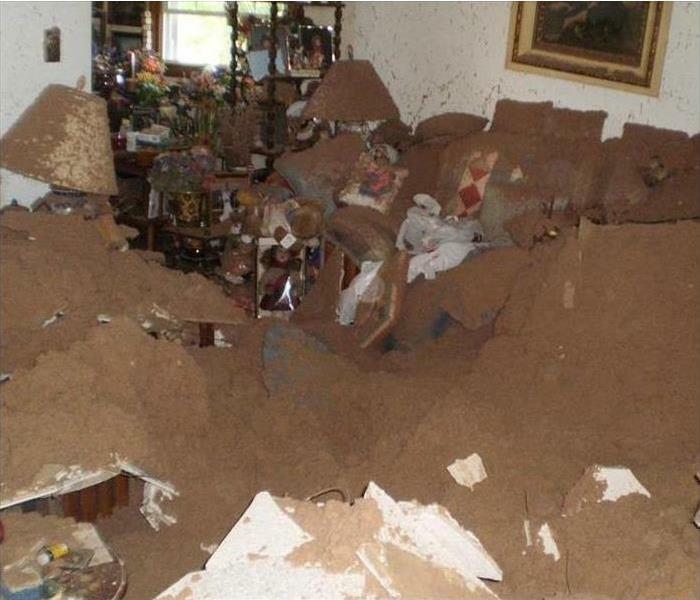 Our fast response time will limit the damage and lower your remediation costs. 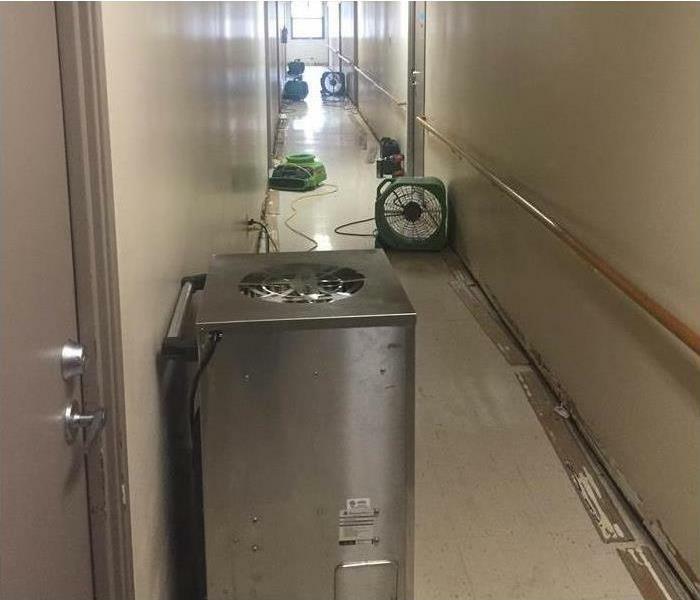 SERVPRO of Durham has the experience, equipment, and training to restore your commercial property to pre-damage condition. We’re Faster to Any Size Disaster! Sometimes water can be in unwanted places in a Durham kitchen. SERVPRO can move appliances, dry out leaks from dishwashers and ice-makers and then make sure the area is free of residual moisture. This heated air mover is taking care of business, just like we do. The fire was quickly extinguished in the attic, but not before SERVPRO techs needed to do a controlled demolition and cleanup. This Newmarket home would soon be as good as new, "Like it never even happened." Call us for fast and polite service. 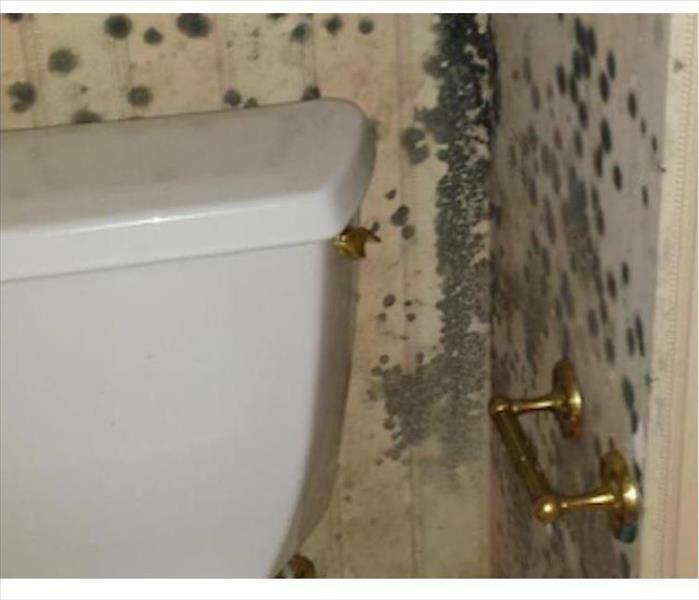 Mold damage in this Durham home’s bathroom developed due to the caulking hardening around the tub and shower area. The caulking ended up cracking allowing moisture to get behind the tile wall and leaving the drywall and studs loaded with moisture. Along with the darkness this created the perfect conditions for the development of mold colonies. 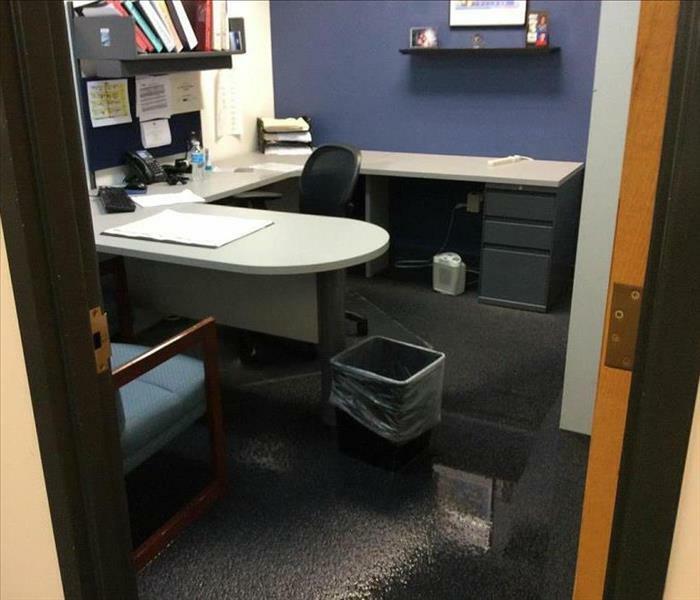 The broken supply line to the nearby restroom flooded the carpeted floor of this Newmarket office. 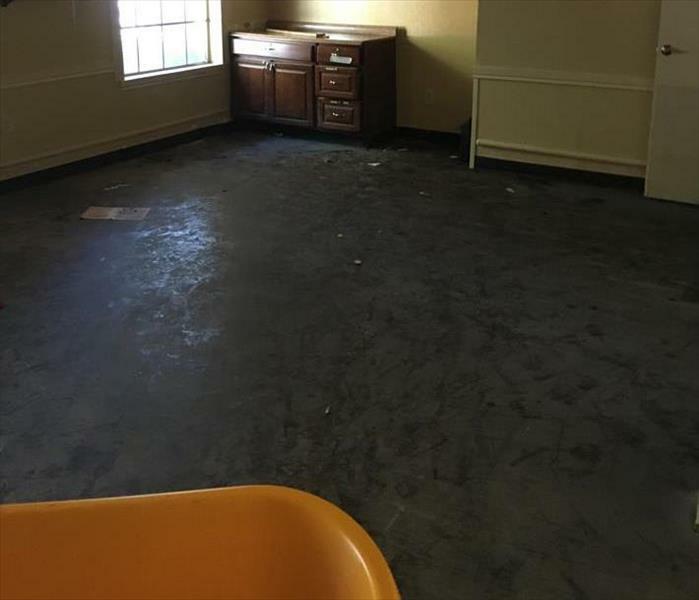 With a fast call, and just as fast a response from SERVPRO, the standing water can be extracted and the furnishings preserved from water damage. We're Faster To Any Size Disaster. 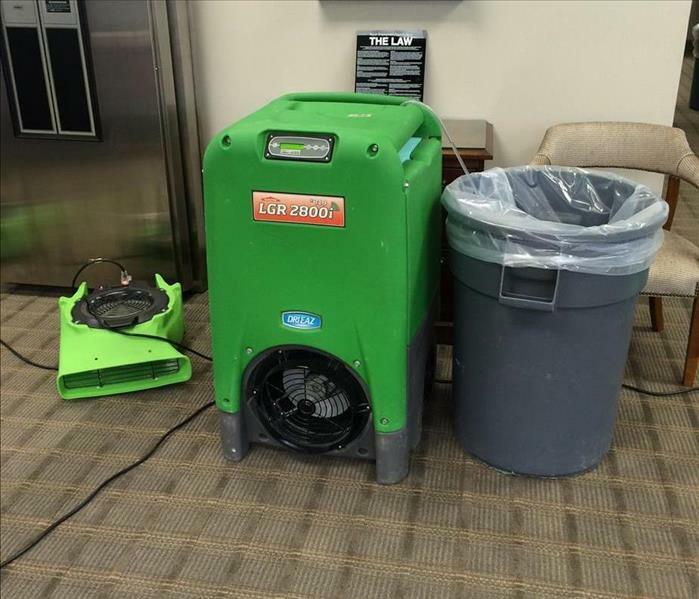 The SERVPRO arsenal of water and moisture removal equipment is very extensive. Our Green Fleet and warehouse are fully stocked with air movers and LGR dehumidifiers to expedite the evaporation and moisture control. Whether in Kingston homes and places of business or the surrounding areas, we are just a call away. The team at SERVPRO of Durham can handle any size mold infestation, and our specialists are ready 24/7. 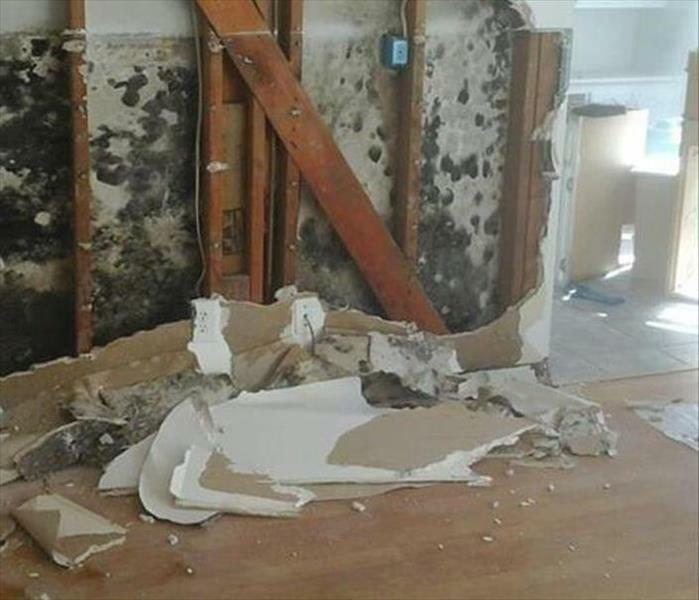 Our mold remediation specialists have the equipment, training, and equipment to restore your home to pre-damage condition. 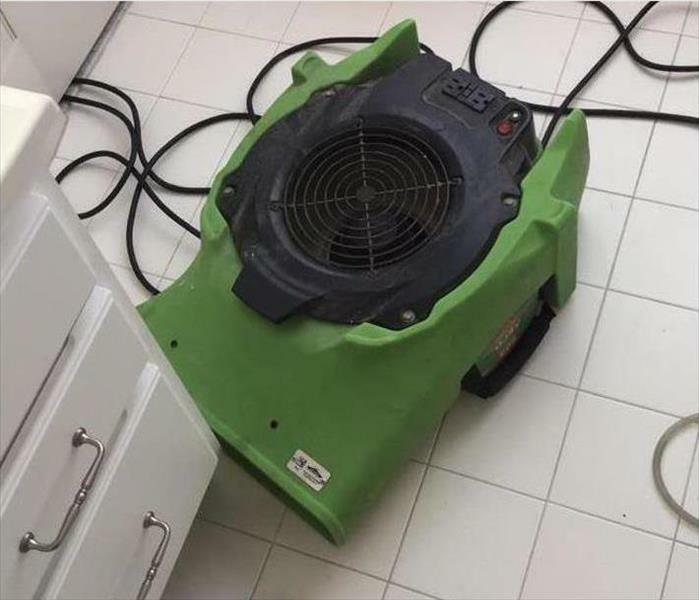 SERVPRO of Durham is Faster to Any Size Disaster! 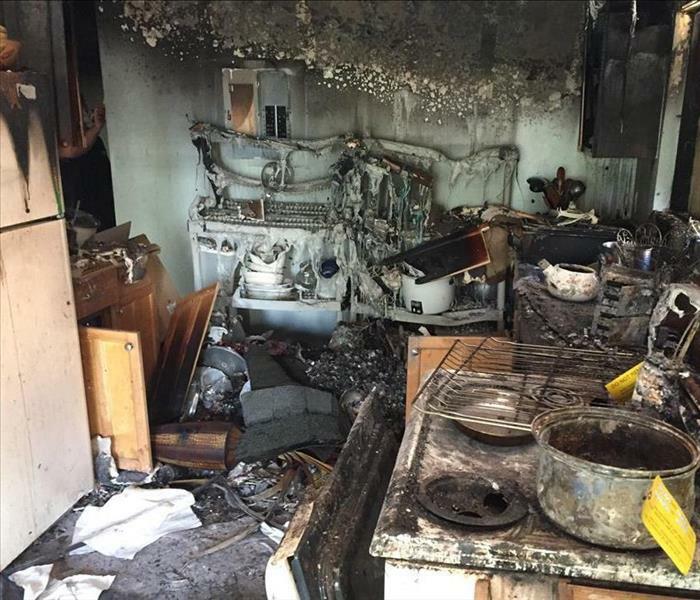 The degree of fire damage to this kitchen is Kingston means that SERVPRO technicians would spend a large amount of time on the demolition and cleanup. Odor control is a high priority to at least mitigate secondary damage to the unaffected rooms of the unit. Hydroxyl generators can also make the indoor air quality a bit better during the cleanup for the sake of the workers. Water that covered the floor of this daycare center in the Durham area was quickly removed. Many businesses rely on the We're Faster To Any Size Disaster team from SERVPRO to restore order and continuity to their routines. You can, too. When it comes to storm damage restoration, the experts at SERVPRO are the best in the industry. Storm damage can happen at any time, and our professionals are available 24/7. Our storm damage specialists have the training, equipment, and expertise to restore your property to pre-damage condition. 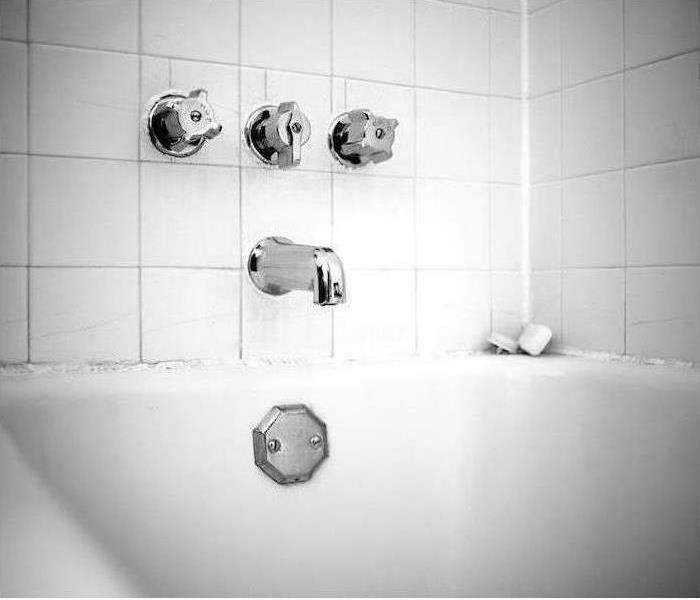 With the lack of circulation and temperature control, mold can quickly develop from the available moisture. 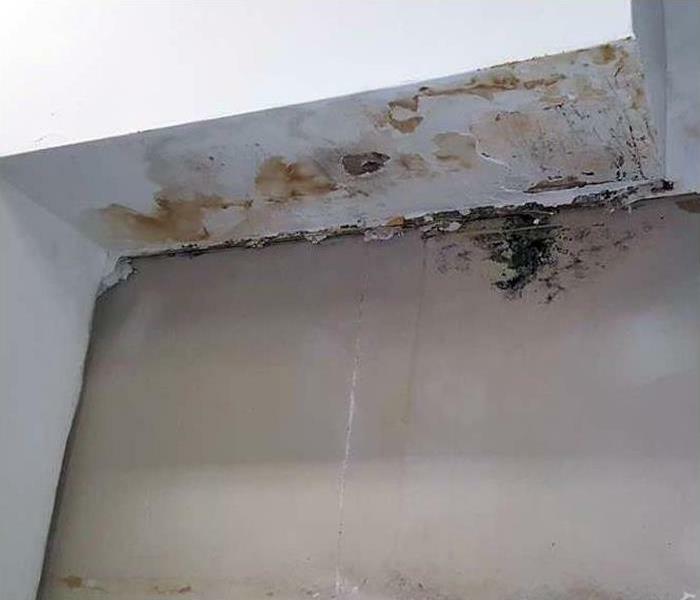 Public businesses in the Newmarket area do not help their bottom lines until a company like SERVPRO can provide professional mold remediation. We are ready to help, 24/7. 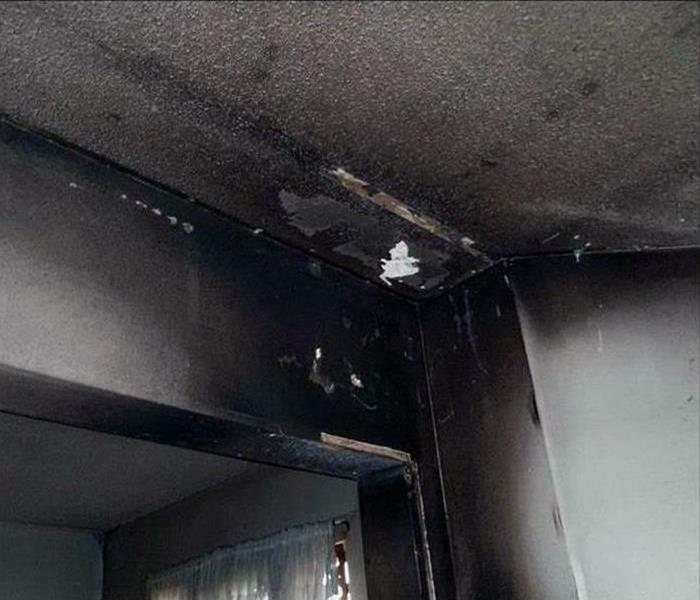 SERVPRO knows smoke and soot can cause significant damage to your property. Our fire restoration technicians are available 24/7 and are certified by the IICRC in fire restoration. SERVPRO of Durham is a leader in the restoration industry, locally owned and operated, and Faster to Any Size Disaster. 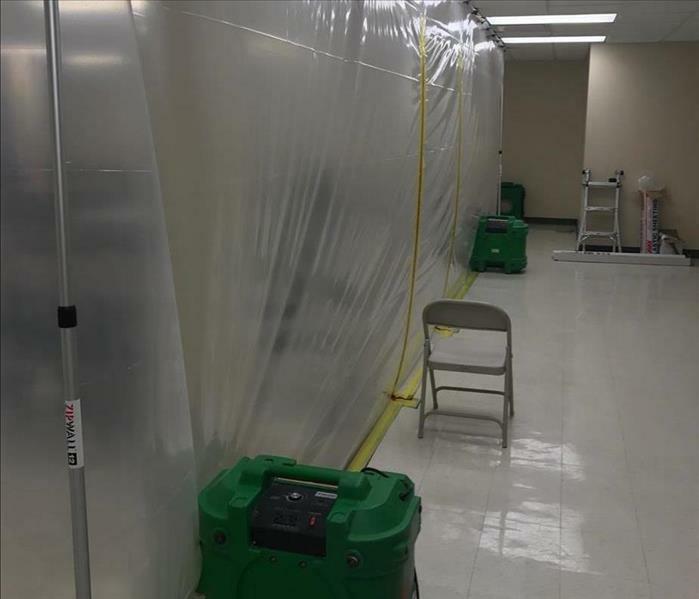 Water damage struck this Durham office building when the fire-suppressant sprinkler system malfunctioned. 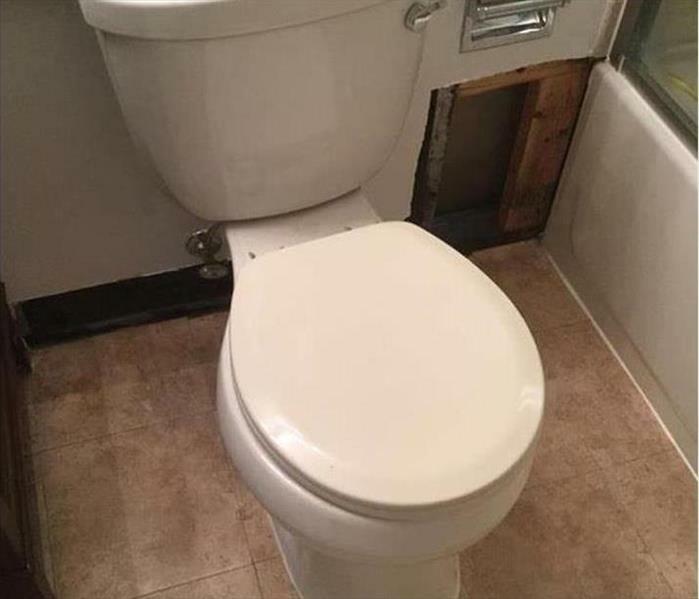 The building manager knew he needed professional help to clean up the water and he needed a quick response to limit the damage. SERVPRO of Durham provides 24/7 emergency service for water damage events, and they maintain equipped trucks which are ready to roll on a moment's notice. If a storm pulls off a large section of the roof in a Newmarket property, the volumes of rainwater can collapse the ceiling. The mess shown is the blown insulation and the destroyed sheetrock. 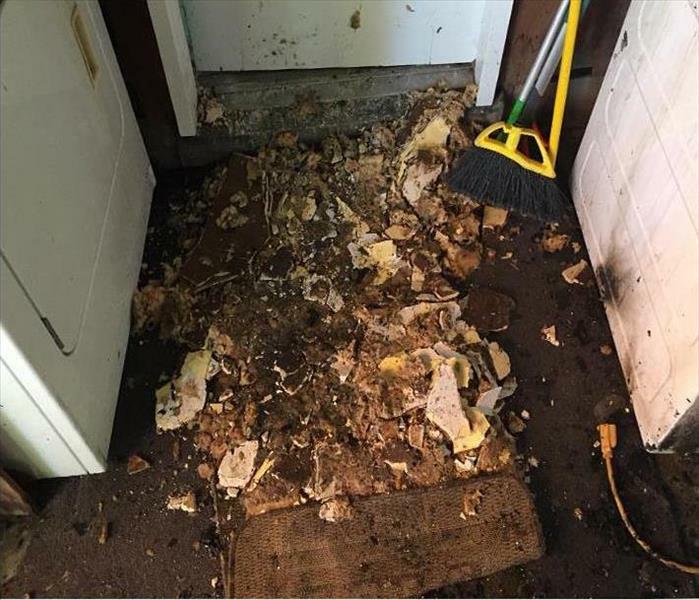 SERVPRO can come with a large crew to clean up all the fallen debris to mitigate secondary damages caused by the wetted materials. Mold damage at this Durham condominium illustrates how mold can grow and result in significant damage. This condo was unoccupied, so the mold growth went unchecked for some time. Damage this severe would require tearing out the damaged building elements and cleaning and sanitizing the entire affected area. Storm damage in Durham can be severe at times. 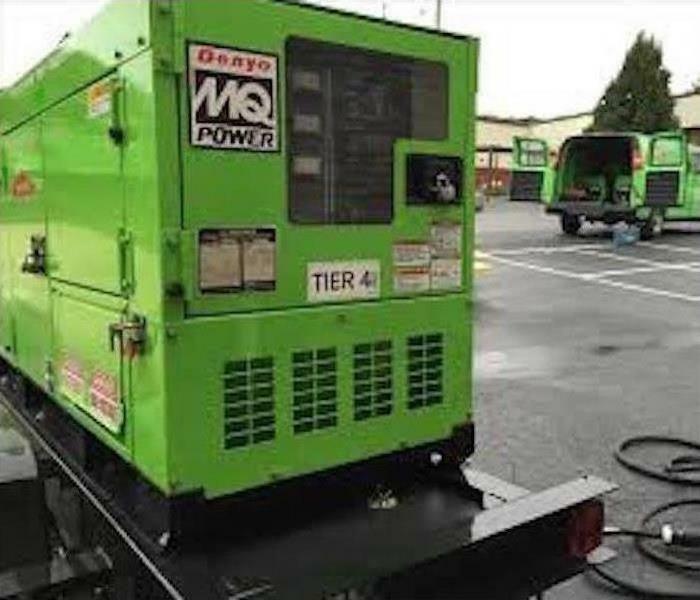 Sometimes it results in power outages requiring SERVPRO of Durham to bring their own power to operate their storm damage restoration equipment. Pictured is a trailer mounted portable generator used for such occasions. 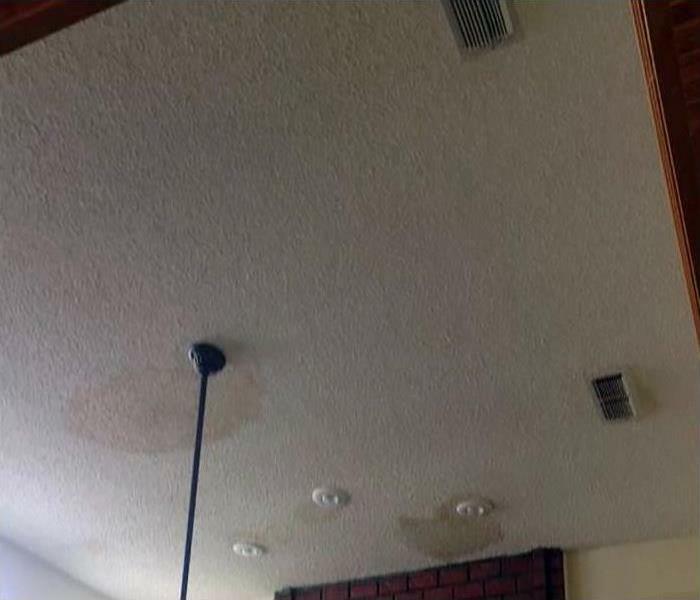 When dealing with water damage, you need the help of a professional water removal and cleanup specialists. 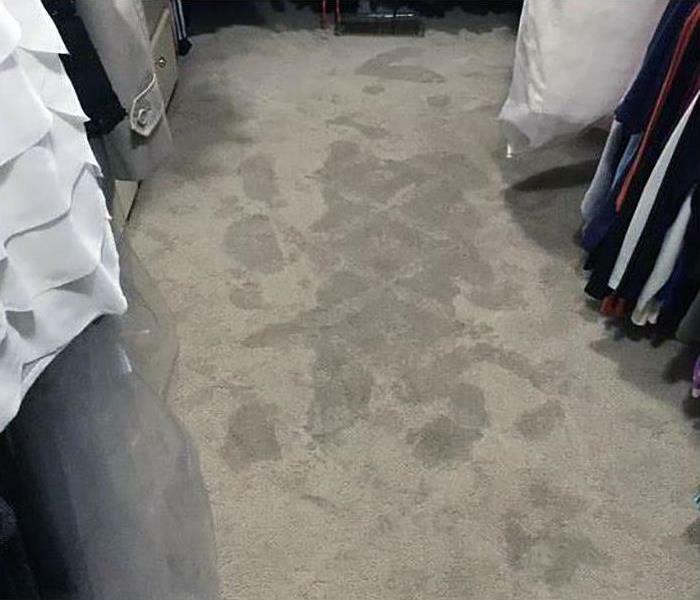 Our staff of trained and certified experts will use advanced drying techniques and state-of-the-art water removal equipment to return your property to pre-damage condition. We’re Faster to Any Size Disaster! 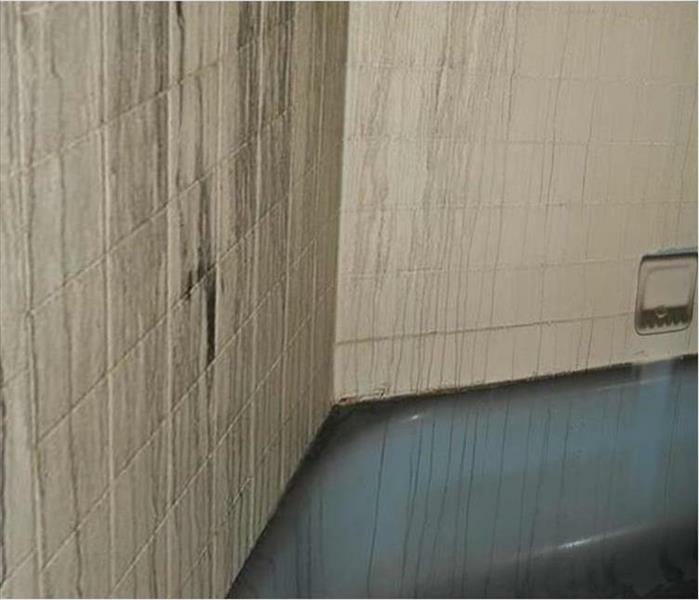 The residue from a small fire in this Durham bathroom was wiped down with special sponges and detergents. 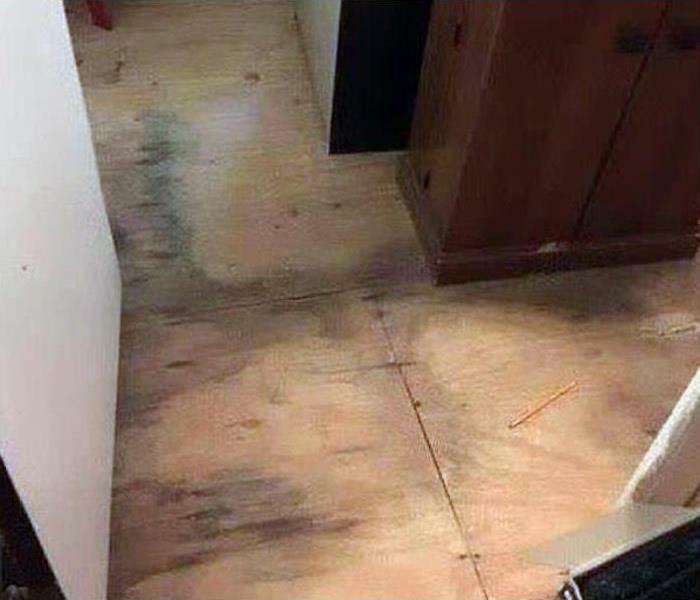 SERVPRO has the training and equipment to make this room look and smell "Like it never even happened." 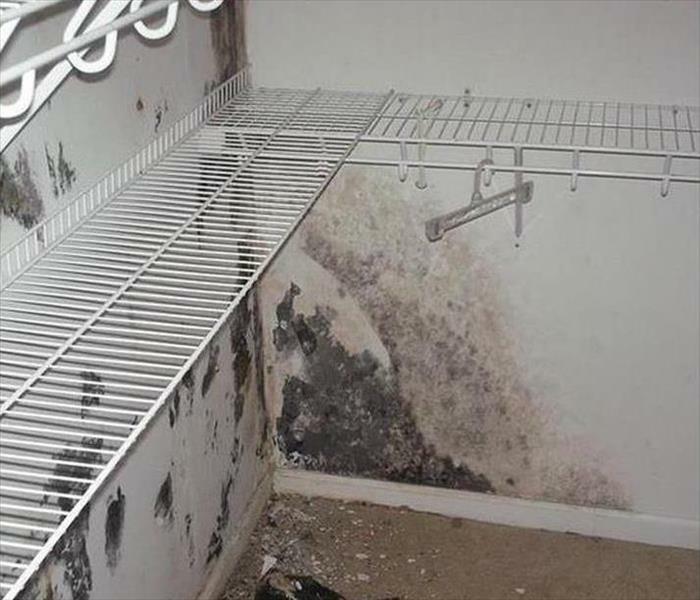 This mold infestation in a Newmarket closet needed removal of the non-salvageable sections of the drywall. Once opened, the wall cavity would be sprayed with an antifungal chemical to kill any remaining mold spores. The closet was deodorized as a step in the remediation process. The wind tore a hole in the roof letting in a deluge of water in this Newmarket bathroom. The drop ceiling, sagging and a safety hazard, was about to be taken down and discarded. Our SERVPRO crew covered the damaged roof with tarps before continuing with the storm damage restoration. The floodwaters flowed in through the rear of this Durham office building. The water, mostly sourced from the asphalt parking lot, though contaminated, was relatively clean of debris. 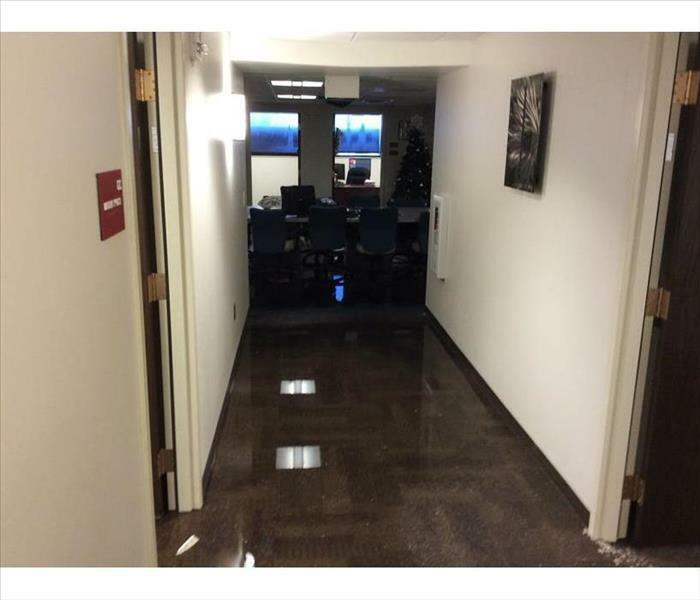 SERVPRO team members relocated the office furnishings to mitigate damages and then started the water extraction. The staff at SERVPRO of Durham cleaned and restored sixteen buildings at the Great Lakes Naval Base after a flood disaster struck their property. We worked around the clock to minimize disruption to their base. When disaster strikes, our team will be there for you to get rid of the damage "Like it never even happened." The team at SERVPRO of Durham is ready to help with the aftermath of Hurricane Harvey. 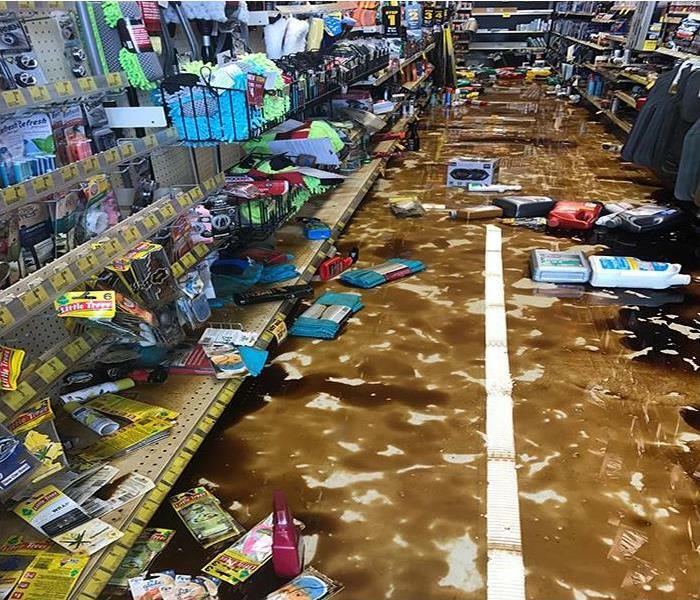 Our Disaster Recovery Team was contacted by Advanced Auto Store to aid in the restoration of any damaged property. We were contracted to service any or all of their 85 store locations as well as 2 distribution centers. No job is too large for the crew at SERVPRO! 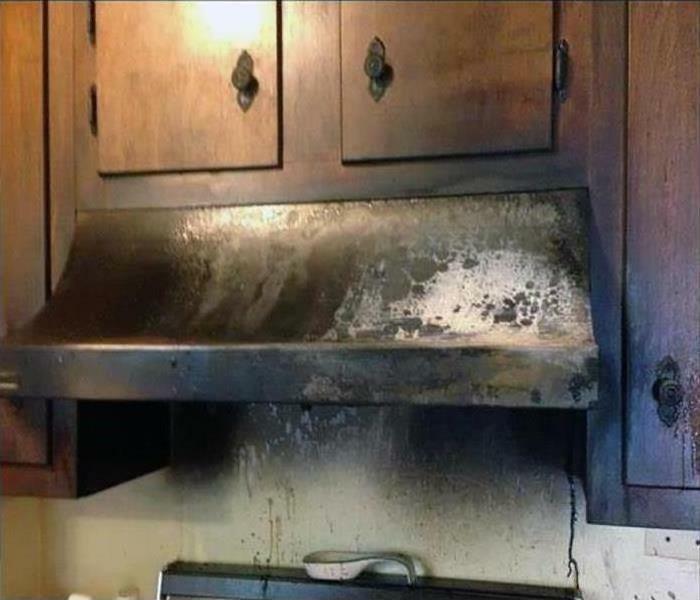 No homeowner in Newmarket would be happy to survey this kitchen damaged by a grease fire. SERVPRO team members immediately started a demolition to remove the charred building elements and appliances to get ready for the restoration and rebuild. 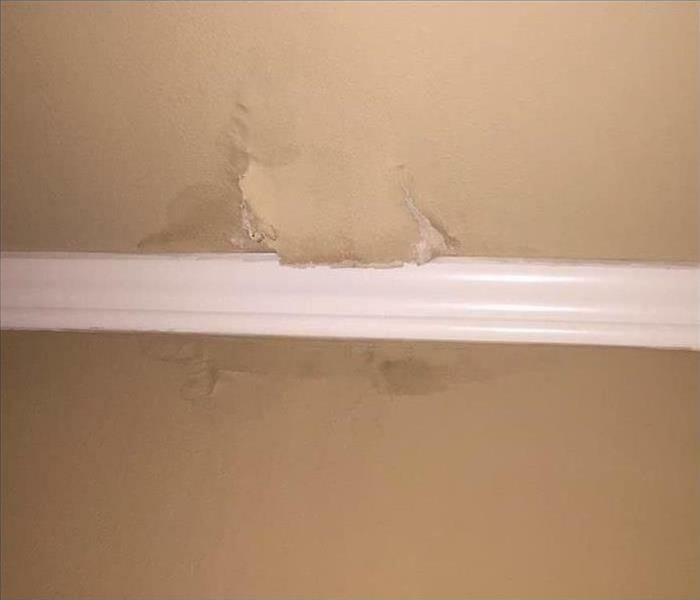 The broken pipe drenched the carpet in this downstairs rec room in a Durham home. 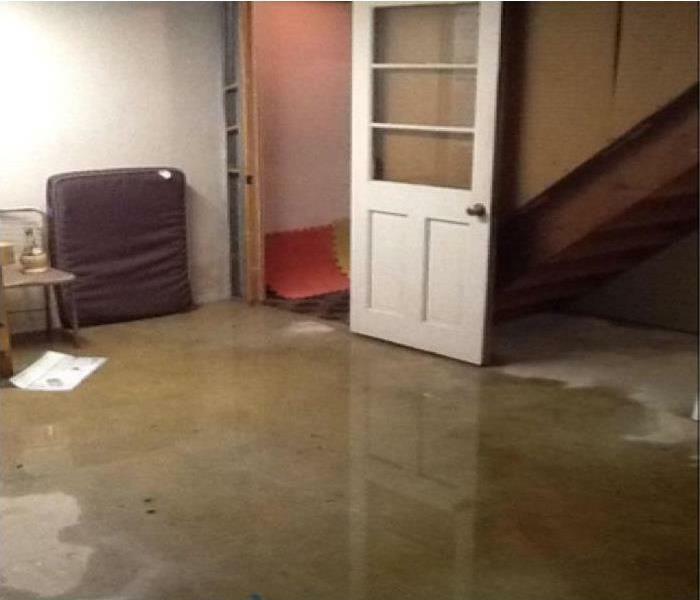 Fast water extraction by our SERVPRO team mitigated damages, inconveniences, and expenses for the homeowner. We're Faster To Any Size Disaster.